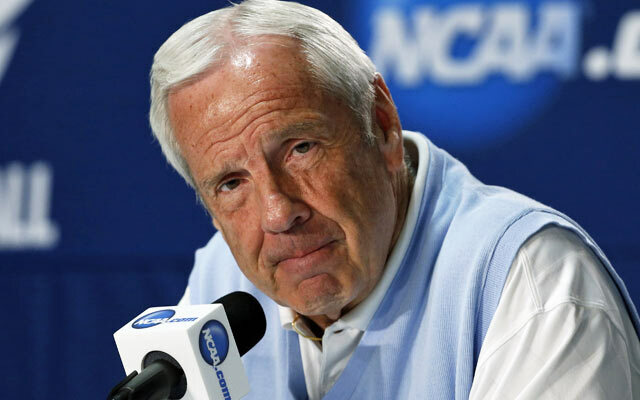 CHAPEL HILL, N.C. -- The first time Roy Williams saw Julius Pepers in a summer basketball tournament he was still coaching at Kansas. Upon hearing Peppers was committed to North Carolina he thought the kid was in over his then-6-foot-5 height. “The Peach Jam is my favorite tournament of the summer time,” Williams said of the annual basketball recruiting event in North Augusta, S.C. “I’m watching this guy and somebody said he’s going to Carolina; they offered him a scholarship. Then Williams was informed the "under-sized basketball kid" from Southern Nash High in Bailey, N.C., had accepted a football scholarship from then Tar Heels coach Carl Torbush, who had succeeded Mack Brown. He was undersized for a power forward but certainly not for football. Williams recalled the story during a break from talking about the No. 9-ranked Tar Heels (16-4, 6-1 ACC) traveling for an ACC game against No. 15 Louisville (16-5, 7-1 ACC) at 2 p.m. Saturday at the Cardinals’ KFC Yum! Center. Peppers was back in the news Friday after the Carolina Panthers defensive end announced his retirement following 17 NFL seasons, with two Panthers stints sandwiched around Chicago and Green Bay. Peppers' early football promise made sense to Williams, but the athletic big guy ultimately left his mark in the hallowed annals of Tar Heels basketball, too. He doubled up, playing three football seasons and two basketball seasons as a 6-6, 280-pounder. Williams, who played on North Carolina’s freshmen team during the Dean Smith years, said Peppers’ bulk must have been a nightmare for some basketball opponents. Peppers redshirted his first year on campus, 1998-99, before he broke into the football lineup as a redshirt freshman defensive end in the fall of 1999. He led the Tar Heels in tackles for a loss (10) and sacks (6). Following the season, Torbush allowed Peppers to join the 1999-2000 basketball roster. He came off the bench in 31 games, posting averages of 4.5 points and 3.5 rebounds a game. He didn't score much, but he was known for thunderous dunks, including one that made ESPN SportsCenter's Top 10 plays. North Carolina advanced to the 2000 Final Four under Bill Guthridge. The Tar Heels beat Missouri, Stanford, Tennessee and Tulsa before losing in the semifinals to Florida, which fell to Michigan State in the championship game. In the 2000-01 school year, his redshirt sophomore football season included leading the nation in sacks with 15. In basketball, his numbers were 7.1 points and 4.0 rebounds. He made two of his three starts that year in the NCAA Tournament. He scored 12 points in a win over Princeton and had the game of his hoop career with a double-double despite a loss to Penn State, 82-74. Peppers posted 21 points and 10 rebounds. In the 2001-02 school year, Peppers’ redshirt junior football season was so accomplished he began preparing for the NFL Draft rather than playing the winter basketball season. In football, he was a first-team unanimous All-American pick. He also claimed the Chuck Bednarik Award as the nation’s top defensive player and the Lombard Award as the top lineman. Peppers was selected second overall by the Panthers and then-coach John Fox and then-general manager Marty Hurney, who after an absence from Charlotte returned as the Panthers' GM during Peppers' final two NFL seasons. He finished his career a nine-time Pro Bowler with the NFL's fourth highest career sack total (159.5). Peppers’ career is one of those cautionary tales against specializing in sports at a young age. He thought he was a basketball player until Southern Nash's football coaches convinced him to come out for their team his senior year. Without his high school coaches, he might have lived a life of unrequited basketball love instead of one that may grant immortality in the Pro Football Hall of Fame. Yes, he was a good college basketball player. He also helped Southern Nash to a 1998 state team track title as a sprinter and triple-jumper. He was a freak athlete as a 220-pound kid that ran on the 4x100-relay team that won the state title and he finished second in the triple jump at 46-1. But football was the sport he was born to play, whether he knew it or not. “I didn’t grow up playing football,” he wrote while announcing his retirement in "The Players Tribune." “I wanted to be a basketball player. MJ was my idol. I was lucky because growing up in tiny little Bailey, North Carolina, we had a satellite dish, so we got WGN. Which meant we got almost every Bulls game. So on most nights, you could find me in front of the TV, watching the G.O.A.T. do his thing. All these year later, Peppers clearly invested his athletic talent in the right sport, but Williams doesn't overlook he was a special football player with basketball skills. Not all big guys can double up in basketball. Williams returned to his alma mater in 2003-04, two years after Peppers left campus, but he still got a chance to coach Peppers, even though he made him sit and watch from the bench. For North Carolina’s 100th anniversary basketball celebration in 2010, Peppers was among the alumni that returned to campus to play an exhibition game. Peppers might have another introduction, this one in Canton, Ohio, in his football honors future.